There is nothing quite like that first taste of salty and sweet homemade peanut brittle. While you can certainly stock your shelves with yummy peanut brittle from Aunt Ruby’s, consider making this delicious treat yourself. To do this, you need to have a great peanut brittle recipe. Well, you’re in luck! 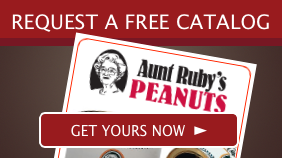 The staff at Aunt Ruby’s is dedicated to providing you with copious amounts of this treat along with this yummy peanut brittle recipe to make this delicious treat at home - if you're feeling a little adventurous. That’s it! There are no other ingredients necessary to make peanut brittle (unless you plan on adding your own special “surprise”). The first step is to grease two large cookie sheets and set them aside. In a saucepan, bring water, salt, corn syrup and sugar to a boil over medium heat. Continue boiling until the sugar is completely dissolved. Once this is achieved, stir in your peanuts and use a candy thermometer to discover when it reaches 300 degrees F.
At this point, you should remove the mixture from the heat and stir in the baking soda and butter. Pour it on a cookie sheet and use forks to pull the mixture into a rectangle. Allow it to cool and then snap it into small pieces. The last step is to enjoy your delicious treat. Keep in mind, you can alter the recipe to suit your needs, or simply order the delicious peanut brittle sold by Aunt Ruby’s. This will save you the cleanup afterwards, too.